The Bird’s Nest Fungus, Crucibulum laeve, is a common summertime find in our area. While the fruitbody can be up to 0.8cm tall and wide, it is not uncommon for them to be much smaller based on the substrate and growing conditions. They are tan, yellow, to cinnamon colored, velvety, and cylindrical or cone shaped. There are four Bird’s Nest fungi common to our area, and all are difficult to photograph due to their small size. Cody found this one inside a hickory shell, so we were able to move it to a table with better lighting than the deep, dark woods. When young, the top of C. laeve is covered with a drum-like membrane. At maturity, the membrane will break away, revealing 8 to 10 peridioles (eggs). The eggs are dispersed is a splash cup mechanism when a raindrop flips them out. Eventually, the outer coating of the peridioles will weather away, releasing the spores into the environment. The splash cup and eggs seems like a novel approach to spore dispersal, but there is an additional element, seldom discussed, and little understood. 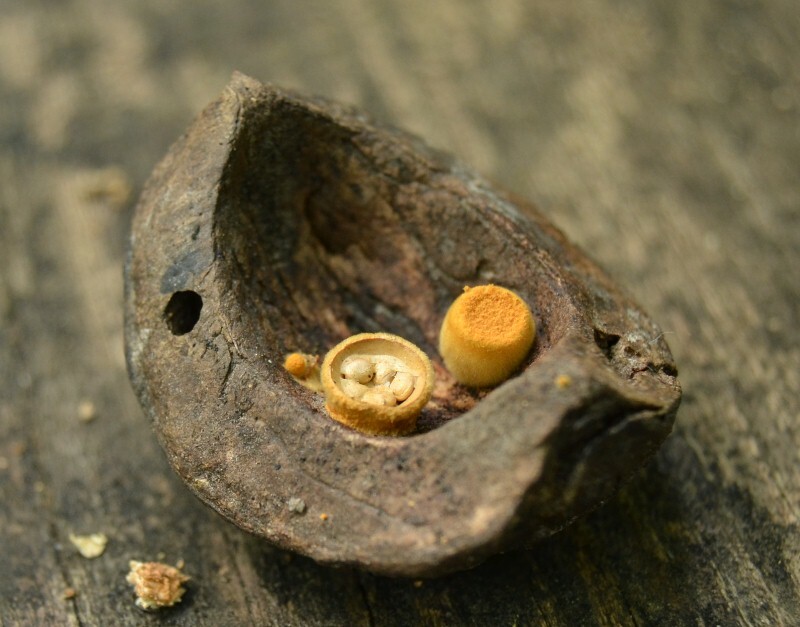 In Bird’s Nest fungi, the eggs are attached to the cup with a long cord. When the eggs are splashed out, the cord unwinds from the cup, breaks away from the cup, but stays attached to the egg, trailing behind like a kite string. 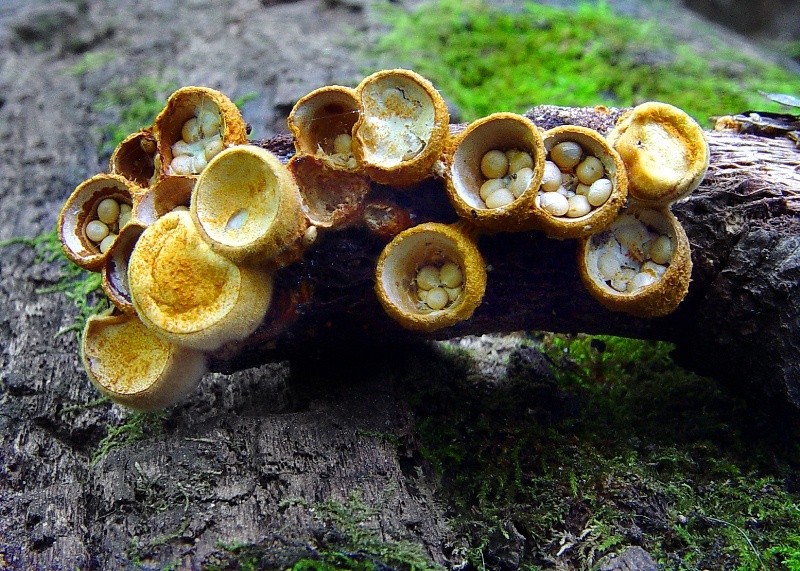 In Michael Kuo’s discussion of Bird’s Nest Fungi, he proposes that the cord wraps around blades of grass or twigs, allowing the eggs to be eaten by herbivores. This makes sense for Cyathus stercoreus, commonly found on dung or manured soil, but not for Crucibulum laeve, commonly found on woody debris and wood mulch. Since the eggs are always dispersed during a hard rain, I propose that the sticky cord keeps the egg from floating away once it has landed. This is one of my favorite aspects of amateur mycology – there are still so many details yet to be fully understood.